Feature When Samsung unveiled its next-generation smartphone, the Galaxy S4, in March this year, most of the Korean giant’s fans focused their attention on the device’s big 5-inch, 1920 x 1080 screen, its quad-core processor and its 13Mp camera. All impressive of course, but incremental steps in the ongoing evolution of the smartphone. More cutting edge is the S4’s promised support for a technology called HEVC. HEVC is short for High Efficiency Video Coding. It’s the successor to the technology used to encode video stored on Blu-ray Discs and streamed in high-definition digital TV transmissions the world over. The current standard is called H.264 - aka MPEG 4, aka Advanced Video Coding (AVC) - so it’s no surprise that HEVC will become H.265 when the Is and Ts are dotted and crossed on the final, ratified version of the standard later this year. This final standardisation is just a formality. The International Telecommunication Union (ITU-T), the body which oversees the "H" series of standards, and its partner in video matters, the ISO/IEC Moving Picture Experts Group (MPEG), have both given HEVC sufficient approval. This means device manufacturers such as Samsung, chipmakers such as Broadcom, content providers such as Orange France and mobile phone network operators such as NTT DoCoMo can begin announcing HEVC-related products safe in the knowledge that the standard will be completed with few, if any further changes. It has taken H.265 three years to reach this stage, though exploratory work on post-H.264 standards goes back to 2004. The drive to develop the standard - a process overseen by a committee called the Joint Collaborative Team on Video Coding (JVT-VC) and comprising members of both MPEG and ITU-T - was outlined in January 2010 in a call for specification proposals from technology firms and other stakeholders. Their brief is easy to summarise: H.265 has to deliver a picture of the same perceived visual quality as H.264 but using only half the transmitted volume of data and therefore half the bandwidth. H.264 can happily churn out 1920 x 1080 imagery at 30 frames per second in progressive - ie, frame after frame - mode, but it’s expected to start running out of puff when it comes to the 3840 x 2160 - aka 4K x 2K - let alone the 7680 x 4320 (8K x 4K) resolutions defined as Ultra HD pictures. H.265, then, was conceived as the technology that will make these resolutions achievable with mainstream consumer electronics kit like phones and televisions. Of course, 4K x 2K and up are, for now, thought of as big-screen TV resolutions. But it wasn’t so very long ago that 1920 x 1080 was considered an only-for-tellies resolution too. Now, though, plenty of phones, of which the Galaxy S4 is merely the latest, have screens with those pixel dimensions. Some tablets have higher resolutions still. And while today’s mobile graphics cores have no trouble wrangling 2,073,600 pixels 30 times a second, that’s still a heck of a lot of data for mobile networks to carry to them, even over the fastest 4G LTE links. And so, in addition to supporting Ultra HD resolutions on large TVs, H.265 was conceived as a way to deliver larger moving pictures to phones while consuming less bandwidth requirements than H.264 takes up. Or to deliver higher, smoother frame rates over the same width of pipe. This explains NTT DoCoMo’s interest in the new video technology. Its 2010 proposal to the JVT-VC was one of the five shortlisted from the original 27 suggestions in April 2010. All five could deliver a picture to match a good H.264 stream, but only four, including NTT DoCoMo’s, were also able to deliver a compression ratio as low as a third of what H.264 can manage. The JVT-VC’s target was 50 per cent more efficient compression for the same image size and picture quality. The remaining proposals were combined and enshrined the the JVT-VC’s first working draft, which was published the following October. The committee and its partners have been refining and testing that specification ever since. Since June 2012, MPEG LA, the company that licences MPEG video technologies, has been bringing together patent holders with intellectual property that touches on the H.265 spec, before licensing that IP to anyone making H.265 encoders and decoders, whether in hardware or software. So how does the new video standard work its magic? 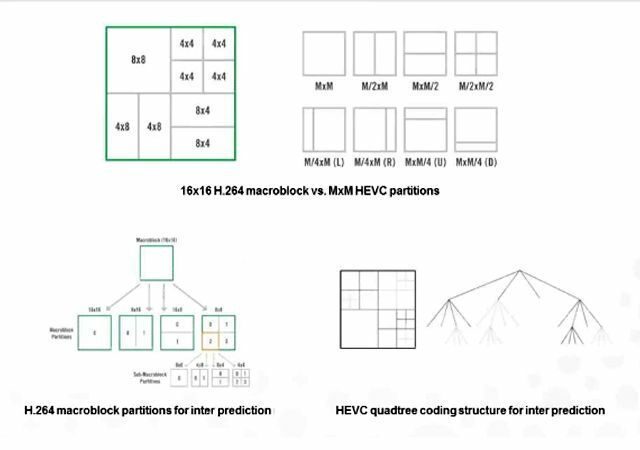 Like H.264 before it - and all video standards from H.261 on, for that matter - HEVC is based on the same notion of spotting motion-induced differences between frames, and finding near-identical areas within a single frame. These similarities are subtracted from subsequent frames and whatever is left in each partial frame is mathematically transformed to reduce the amount of data needed to store each frame.